Rescue extremely dry, dehydrated skin with this sumptuous silky lotion that locks in nourishing moisture for 24 hours. 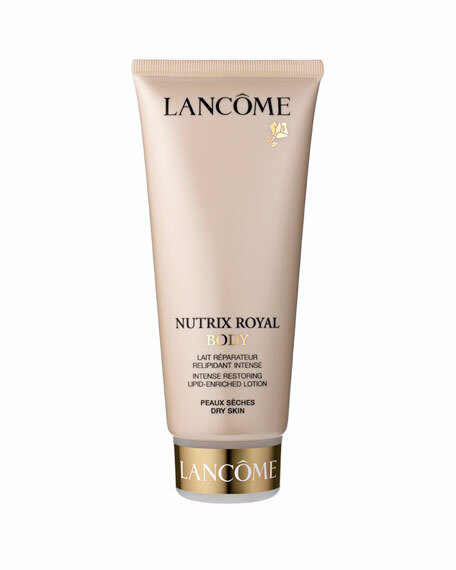 Feelings of tightness virtually disappear, thanks to Lancôme's ultra hydrating formula that's enriched with Royal Jelly for lasting comfort. Almost immediately, skin feels smooth, supple and cushiony-soft. Smoothes and nurtures skin with 24-hour moisture. Cushions and insulates skin from the effects of climate and seasonal changes. Smoothes on effortlessly, drenching skin in comforting moisture for a satiny-soft feel. Royal Lipidéum Complex of Lipidéum and Royal Jelly: Helps skin retain moisture by supplementing its own natural lipids (moisture-binding fat cells found in the skin). Contains Shea Butter, one of the most effective ingredients to fight dryness. Chestnut Peptides increase skin's natural lipid production.